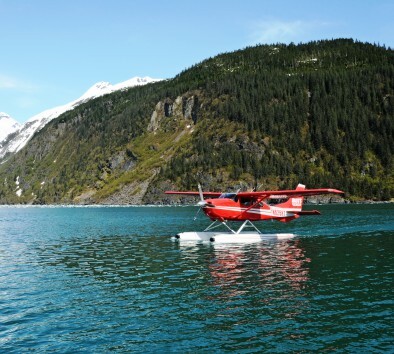 Take off on a float plane from Lake Hood in Anchorage and soar over the Chugach Mountains on the way to Prince William Sound. Prince William Sound is a magnificent region with over 15,000 square miles of fjords and inlets, dozens of tidewater glaciers and rugged mountain peaks. Take in the view and learn about the glacier that shaped the land, water and lakes leaving behind great scenery and interesting geologic features. The sound’s clear sea waters produce a rich marine life. Make sure you spot for humpback, killer whales, seals, eagles, otters and black bears. This tour is a pilot’s favorite destination due to the varied terrain! Dress in warm layers. Bring your camera and sunglasses. Travel time is approximately 45 minutes each way. Flight time is approximately 2½ hours.